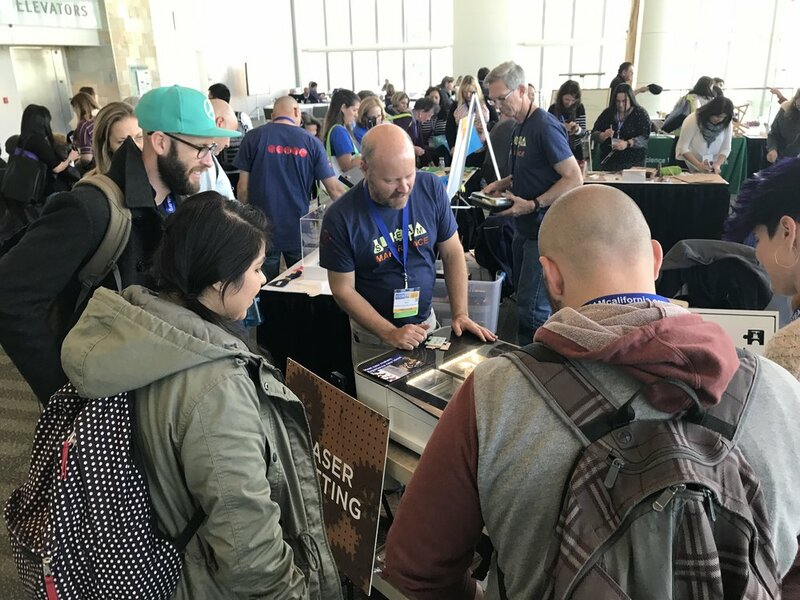 Tinkering at CASTEAM17 — Wonderful Idea Co.
Last week we joined friends from Sonoma County Office of Education, Birdbrain Tech, Tinkering Labs, Maker Ed, Raspberry Pi, Autodesk, Community Science Workshop and more for a pop-up makerspace at the California STEAM Symposium. The conference focused on educators interested in learning more about how to integrate science, tech, engineering, arts and math into their classroom. We thought this would be the perfect place to debut our new animation station micro-exhibits that we've been working on in collaboration with Lodestar School in Oakland. In addition, we led an automata workshop on sunday to try out a new kit, prompts and examples that we've been prototyping with Cabaret Mechanical Theater. Both of these activities felt like a good fit for the event because they authentically combine elements of art and science and are starting points to open up new possibilities for classroom experiments. We set up two tables with the animation stations (suitcase version and a standard rig) and collected materials that included posable paper cats and LED logos as well as a bunch of colorful pattern shapes. Right away, Matt and Courtney from raspberry pi came over to take a look under the hood. We're excited about using the pi for this and other stations because of its flexibility and low cost so it was good to see them enthusiastic about this use for their board. There was a wide variety of different animations and we were excited to see some of the teachers really get into the process of stop motion. They also provided a lot of ideas about how to make the prototype better or connect the workshop to different elements of their subjects or curriculum. Because of the audience, we also developed a little zine that we handed out to participants with information about tying the activity to NGSS standards, some inspirational videos and more things to try. After more testing with the teachers and students at Lodestar school over the next couple of months we're hoping to release plans, kits and fully made versions of the mini exhibit for use in schools, libraries, small museums and makerspaces. We're trying to make it affordable and storable because we know those are limitations for many potential partners. In the corner of the makerspace, Casey and team set up a little classroom for dedicated workshops and activities. We volunteered to lead an hour long cardboard automata workshop so we could test out a few new ideas that we've been thinking about. For the short time period, it was really nice to use the Fire the Inventor kit which lowers the threshold and shortened the time needed for building the mechanical elements inside the cardboard box. This meant that people could move more quickly to designing their characters, scenes and stories on top of the automata. So we worked to develop a set of examples, inspired by the artist pieces on display in their traveling exhibitions, that also incorported interesting linkages and movements. We wanted the examples to be abstract but still imply some possible next steps as a way for workshop participants to follow their own ideas. For materials, we focused on the flexibility of colorful paper as the artistic element and were excited about the wide variety of creations. Some of the participants took their creations to the next level in making a seamless connection between the art and engineering elements of the activity. A couple of my favorites were a dragonfly and lilypad scene, an atomata that depicted two battle bots with hershey kisses as weights and a really intricate mermaid automata with a flapping tail. Both automata and stop motion animation provide approachable starting points to support the "wide walls" of a variety of different creations and the "high ceilings" of each of the elements of STEAM. The next California STEAM symposium will be held in Long Beach, we're already looking forward to see what all these creative makers and teachers will come up with next.